I finally got my own back on my chronically sleep-disturbing minxes – hahahahahahaaaa! <———maniacal sound. Last night (26th July 2012) Maxi and Midi Minx came into my bed 3 times each. That’s 6 times I got woken last night. In 6 hours. So the odds of me being sleepy, dopey and a smidge grumpy were a sure bet. At one point around 4.30am I yelled at Midi in frustration as she stood at the side of the bed, crying. 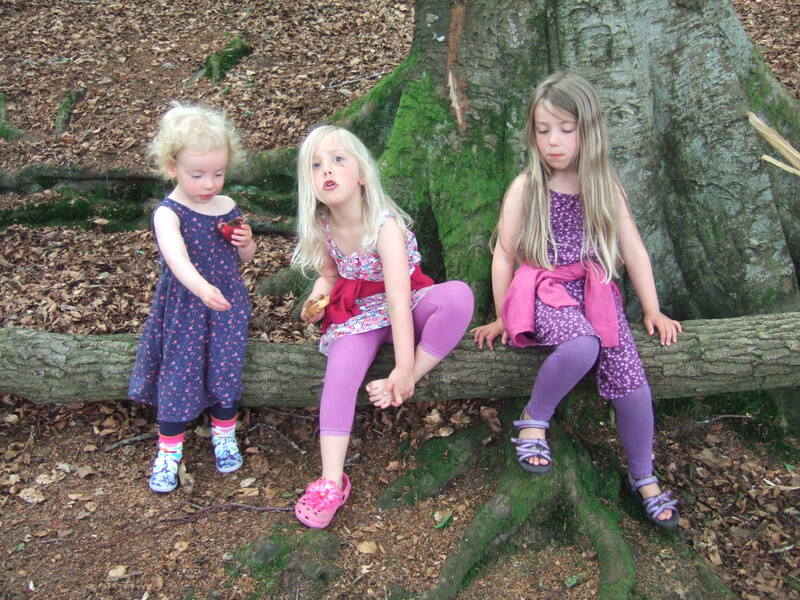 Even as I shouted at her, I knew it was pointless – the poor little girl wasn’t exactly going to stop crying and say brightly: “D’you know what, Mummy, you’re absolutely right: I really am being selfish waking you up just because I’ve woken up. I shall trot off to my own bed, forthwith”. So I got a full dose of guilt on top of despair and frustration and bone-crushing fatigue. The morning was a sludge of trying to remember all the things I’d need to take with me to get the girls and the car to a new garage I’ve never been to before, and a bit of a walk round a nearby town. And it being Scotland, it might be rainy, snowy, icy, sunny, sun-burny, windy. And the girls might be hungry, thirsty, wet themselves, poo themselves, fall over, graze themselves, suddenly refuse to walk any further, try and race away, half-kill each other, run in front of busy traffic. And sleepy, cranky old me had to be prepared for all of it. Hmmmm. Well, the garage visit went very well, at least. I needed an oil change but had been putting it off for a while because it’s not exactly a barrel of laughs taking 3 minxes with you to the garage for hours. And it’s impossible to get it done on a Saturday when The Boss can mind them – I think you need Masonic connections to get a Saturday appointment anywhere. But I’d heard Kinloss Garage was child-friendly, and they could fit me in the next day. Andy the owner kindly made me a coffee on hearing (or maybe just from seeing) how tired I was, then got the car sorted pronto. The price was a LOT lighter on my purse than I’d feared, even though I’d brought my own oil. The minxes thought it was all part of the day out: they drew, read the books, played with cars on the mat, and watched Andy at work on the car (Mini burst into tears when it went up on the ramp, though). 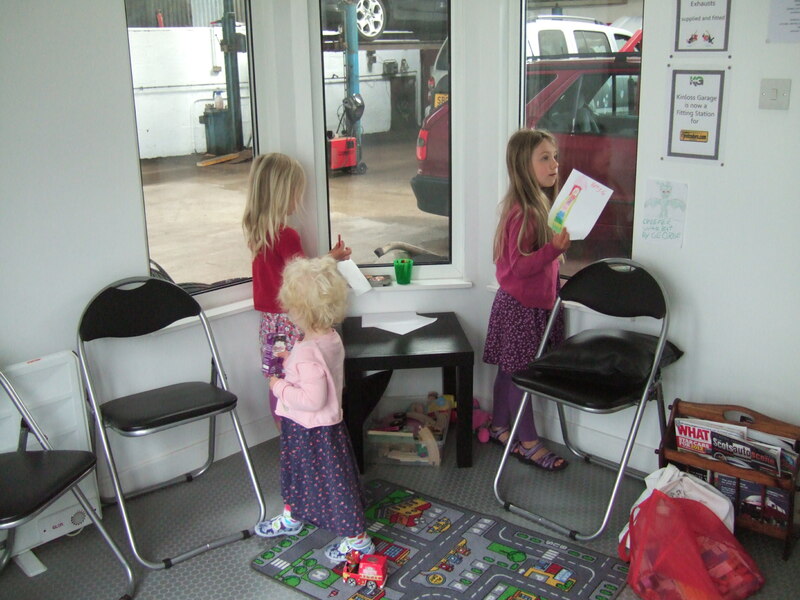 Ahhhh, a genuinely child-friendly garage with a safe, enclosed and welcoming kids’ play area and clean nappy-change bit – what a relief! I’ll definitely be back. So don’t you all go booking him up into next year, because I’ve got more work I need done to the Trout Wagon, soon! Anyway, I digress. We drove over to Forres, whizzed round Tesco to grab some bits for lunch, parked at Grant Park, I loaded up a bag with the million and one things you need to cope with Scottish summer weather, then unleashed the minxes and set off up the hill, around 1030hrs. We only meant to go up the hill to Nelson Tower: “Where does the yellow arrow lead to, Mummy?” asked Maxi. I’d no idea, so we decided to follow it. By the time we’d wound our way off the hill and past the next one, it did cross my mind that we might be heading off on a looooong walk… I decided to keep walking till midday, then either retrace our steps or keep ploughing on. Midi had insisted on wearing overly-large crocs, so she had to stop every few steps to shake leaves, twigs and forest ‘stuff’ out her shoes. I nagged her every single time (guilt, guilt, guilt now…): “If only you’d worn sensible shoes like I told you to”. Yes, she’s 4. Yes, I had a flash-forward to when she’s 15. Yes, I could hear my own mother in my inner ear, nagging me. 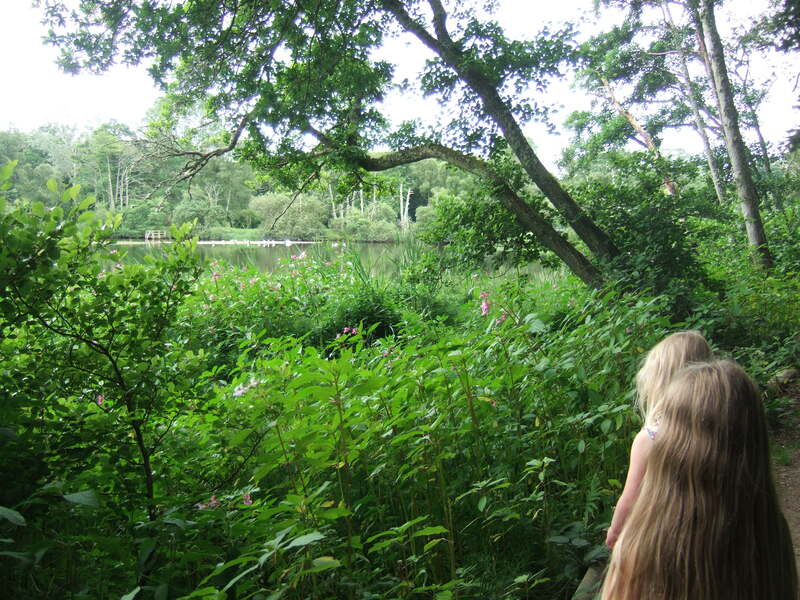 As midday struck, I realised we’d walked for quite a long time for 3 little girls. We also finally came across our first map of the walks so could figure out where the hell we were. Ah. By Sanquar Loch, Chapeltown. Never heard of it. So we’d walked over 2 miles over the past 90 minutes. Alas there was no short-cut back. And stupidly I’d left my purse in the car. So we didn’t have the option to jump in a taxi or bus to get back. The only thing we could do was to continue the circular walk (another 2.5 miles) or cut one little corner and get back in 2 miles. It was the fastest way back. Damn! I decided that this was a good place for lunch, and desperately got some calories down 3 little necks before the swans came over with their almost-adult cygnets. Ten minutes later, with a tired and sleepy Mini on my back in our trusty Carmin Fish sling (thank God I remembered that! ), we were off. So: did they sleep soundly that night? And stay in their own beds all night long? OH YESSSS!!!!! 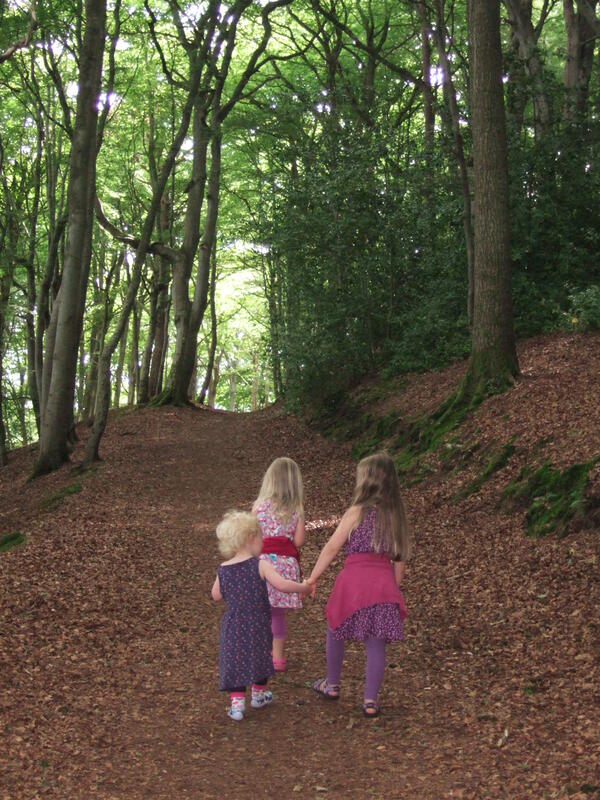 This entry was posted in Mummy Guilt, Out and About, the things kids say and tagged child-friendly car garage, Forres, Grant Park, sleep deprivation, walking with toddlers, wood walk by GrumpyOldTrout. Bookmark the permalink.